After all the big hype about the new Bonchon franchise opening in Lowell, the restaurant had mixed reviews. I read about long waits, cold food, and incorrect orders from Facebook friends and Yelpers. Although the Mo and I wanted to try the restaurant, we wanted to give it sometime for them to "iron out the kinks." The Mo's cousin, Richard is a cook there and we knew he was good so we gave the restaurant the benefit of the doubt. We visited on a late Sunday afternoon and the restaurant was almost empty. We were quickly seated and order our was taken. Of course we had to order the staple Bonchon wings, why else would we be there? We got the 10 piece combo both spicy and garlic. The wait was not long at all, the wings arrived in less than 10 minutes. I'm not sure if they were precooked but it was fast. They were tender yet crispy and I loved nibbling each morsel off the bone, in some cases, I was able to eat parts of the bone. 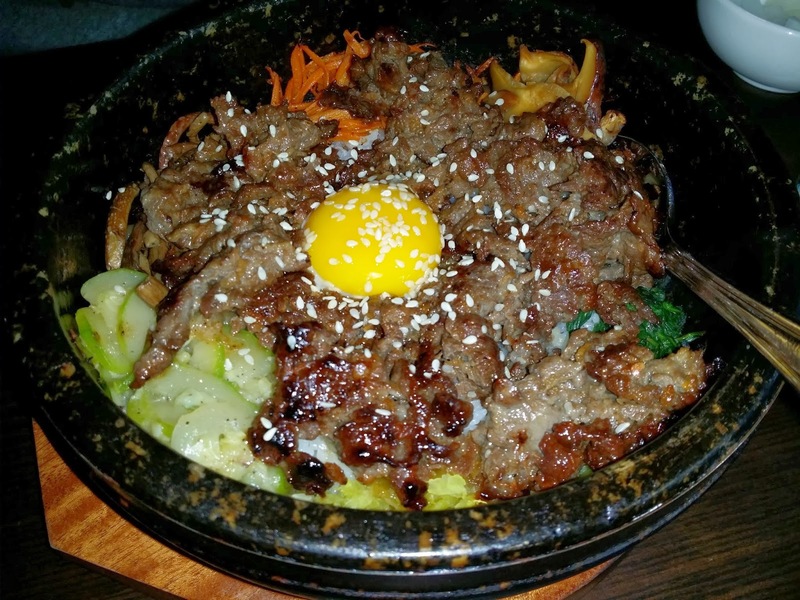 We shared the beef bulgogi bimbimbop, a Korean staple dish with steamed rice served vegetables and delicious red pepper paste served on a hotplate and topped with a sunny side up egg. Our first bimbimbop was actually on a Koreanair flight to Cambodia. It was different but we loved it. The rice dish was cooked to perfection and the texture of the rice was both soft on the inside and crispy on the bottom where it was near the heat off the hot plate. 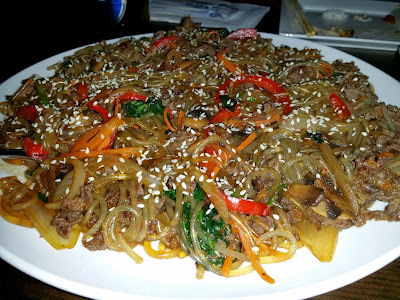 I love Japechae. It reminds me of one of my favorite Cambodian dishes, "Cha Ma Sou -er"m stir fried bean thread rice noodles. The difference is that the Japchae is a sweet potato noodle and darker than the rice noodles. Although it is served as a standalone dish, I prefer it with white rice. It was exactly as I expected but a little on the greasy side. 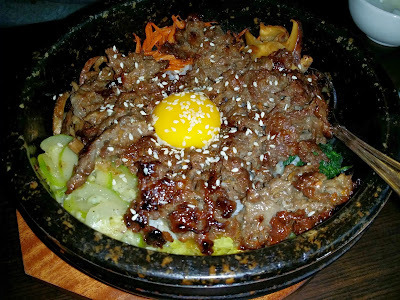 The flavors were great and there was ample bulgogi. The generous portion size dish was plenty for one sitting and 2 days of leftovers. 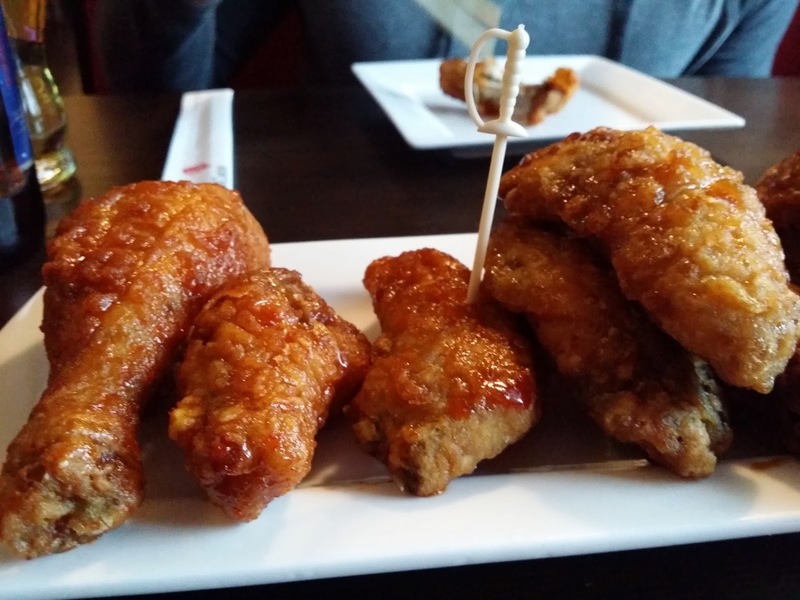 The wings are a bit on the pricey side but the menu offerings are reasonable. I don't think we will be "regulars" at this establishment but its a great place for "Korean" fix. If you follow them on their Facebook page, they post specials for football games and "GNO" (Girl's night out) with free soju or other promotions. 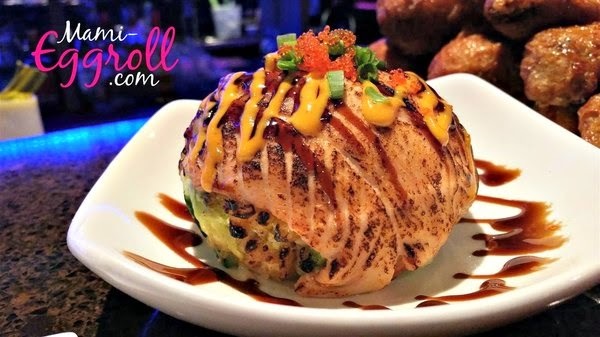 We went back and ordered the wings along with the crispy salmon salad ball. It was amazing!!! !